The viewer is at the intersection of three walkways, in Hemming Park. The gaze is drawn the long, sinuous walkway that stretches away from the viewer. 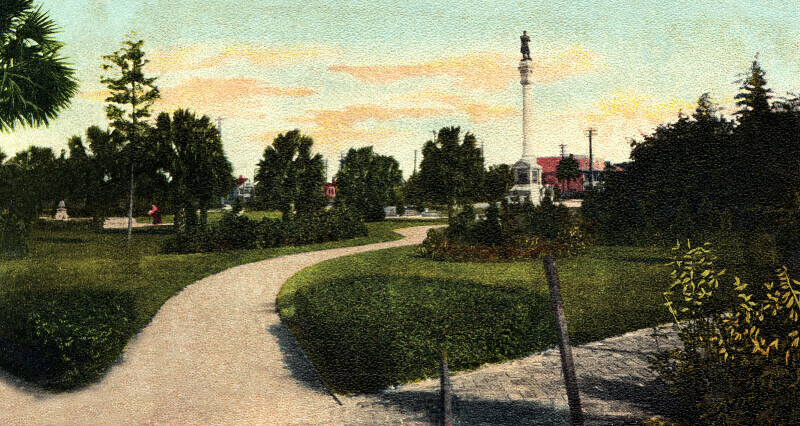 Toward the center of the park, a metal statue has been raised on a white column with a large, stone base. There are numerous pine, palm, and deciduous trees throughout the park. Neatly trimmed hedges help to define the intersection of the three walkways at the viewer's feet.